West Ham’s contribution to spoiling the final day of the season and other haphazard ramblings. 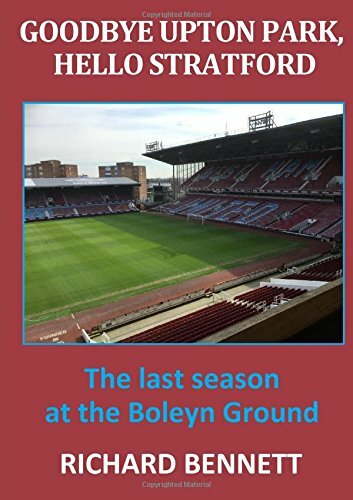 A disappointing consequence for TV executives of West Ham’s excellent victory against Tottenham (and Chelsea’s subsequent win over Middlesbrough) is that the Premier League title race will be all done and dusted well before the final day of the season. There may be final day ‘drama’ to determine Champion’s League qualification or the last relegation place but these are hardly headline acts for the worldwide TV audience to look forward to or get excited about. An early conclusion means there is no requirement for deploying split screen technology or broadcasting gratuitous images of an airborne helicopter awaiting instructions on whether to rush the trophy to Stamford Bridge or the KCOM Stadium. It is the equivalent of the case in Line of Duty being solved in the penultimate week of its run (possibly exposing John Terry as Balaclava Man) while episode 6 then only follows AC12 as they complete the necessary paperwork. I caught a online clip from an American sport’s show where they were bemoaning the fact that both the Premier League and Bundesliga were suffering from premature culmination. It made me wonder whether if TV continues its dominance of football’s revenues that the marketing men will try to convince those who govern the game to introduce a title play-off phase, with perhaps a best of seven finale, to provide the season with an orgasmic money-spinning climax. Another lost opportunity that I am convinced must be on the money-men’s radar are the sub-optimal Champion’s League advertising revenues from the far-east as a result of locally unfriendly kick-off times. At the moment an 8pm kick off in London equals a 3 or 4am one in Beijing. It can’t be long before the fools at UEFA switch these games to weekends giving them priority over domestic fixtures. The average TV viewer in Asia would be much happier watching a world series between, say, Real Madrid and Manchester United than following a full league campaign over the course of a season where there is little interest in the majority of the protagonists. It all sounds very stupid to the paying customer at the turnstiles but that doesn’t mean it won’t happen. On a related note, the televised game between Liverpool and Southampton was so dull that I gave up watching at half time and started to scan through other available channels. In doing so I was surprised to come across a Chinese Super League game with an English commentary. It is interesting to see some of the famous names that are now plying their trade out East including our old friend Nikica Jelavic, currently on loan to Guizhou Hengfeng Zhicheng F.C. The game I saw (a top four clash bewteen Shandong Luneng and Guangzhou R&F) had the usual expected sprinkling of Brazilians, plus the talents of Papsis Cisse and Graziano Pelle, and was a far more entertaining affair than that on display at Anfield. I would predict that the Chinese League will have a far brighter future than that other home for washed up footballers (who are not even good enough to interest West Ham), the US Major League Soccer. It’s almost that time of year where we can ponder which managers will lose their jobs at the end of the season before the respective war chests are handed out. Most probably Watford will lead the annual sack race while the incumbents at West Ham, Stoke, Southampton and even Arsenal may be warily looking over their shoulder as the Chairman approaches.